Black-and-white illustrations. Maps and charts. Index. Bibliography. Chronology. Original documents. In four volumes. Kathleen A. Brosnan, Ph.D., is an associate professor of history and the associate director of the Center for Public History at the University of Houston. She received a J.D. from the University of Illinois and a Ph.D. in history from the University of Chicago. She is the author of numerous articles and the book Uniting Mountain and Plain: Urbanization, Law, and Environmental Change along the Front Range and coeditor of a collection of essays, City Dreams, Country Schemes: Community and Identity in the Twentieth-Century American West. She has served on the editorial boards of Environmental History, Western Historical Quarterly, and the Journal of Urban History and has also served on the executive committee of the American Society for Environmental History. "...provides a wealth of information in a beneficial format that interconnects human society with the physical environment...an excellent addition to any academic and public library reference collection." "...this attractive, informative work will draw students of all ages." 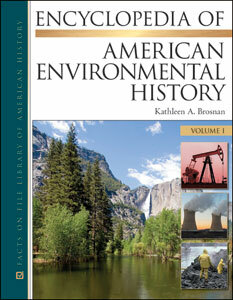 "Environmental history is a relatively new field, and this encyclopedia serves it very well. Highly recommended for academic and large public libraries." "This comprehensive resource on an important topic will be a valuable addition to public, academic, and special libraries. Highly recommended." "...[a] wide-ranging encyclopedia...merits a place in upper-level collections."